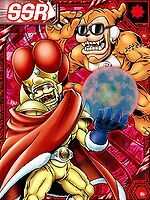 It styles itself among other Etemon as the "King of Etemon", and after all, it is an ultimate form that is said to be a being set at the top. It gets even more carried away and calls itself the "King of Kings". 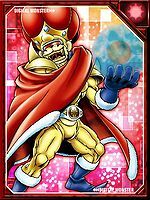 It is snazzily dressed in its "Saru Suit", engraved with the characters "Great King" on its chest, but although it swaggers around with the affectation of a star, it only earns derision from other Digimon. 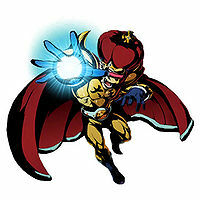 Its Special Move is putting up a false show that cripples the opponent's fighting spirit (Saru Shibai). 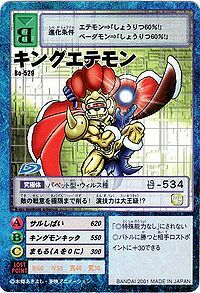 Title: 「キング・オブ・エテモン」 — "King of Etemon"
「キング・オブ・キングス」 — "King of Kings"
「偽のロイヤルナイツ」 — "Fake Royal Knight"
n., Originates from etekou 「猿公（エテコウ）」, a term which refers to a personified monkey. Anime/Manga Super Evolution Stage "Digimon Adventure tri. ~Adventure of August 1~"
3.3.1 Super Evolution Stage "Digimon Adventure tri. ~Adventure of August 1~"
Saru Shibai  Monkey Play サルしばい N/A Monkey Wrench/Monkey Busines Puts up a false show to cripple the opponent's fighting spirit, and/or throws a ball of energy at them. Super Evolution Stage "Digimon Adventure tri. 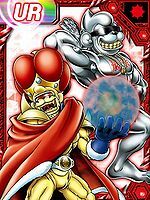 ~Adventure of August 1~"
King Etemon is an enemy digimon. 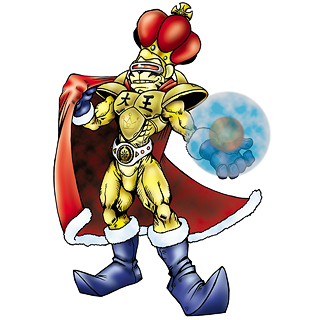 King Etemon is an unobtainable digimon. He appears to give a quest. 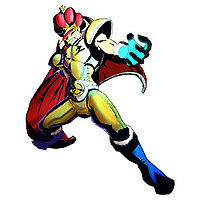 King Etemon is an available Side Evolution for Metal Etemon. It can be unlocked if level 65 or above with the item Great King Suit. King Etemon is available as a Digimon Medal. 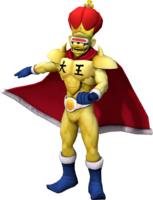 King Etemon is an enemy Digimon in Secret S.
King Etemon is available by DigiXrossing Pandamon, Ex-Tyranomon, Goburimon and Tyumon. 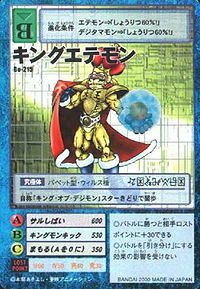 King Etemon is an unobtainable Leader Digimon. 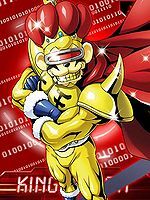 This self-proclaimed 'Royal Knight' specialises in monkey bluffs! 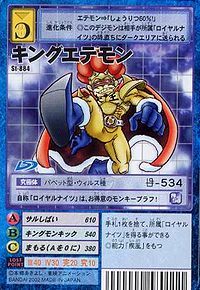 Swaggering around like a star, it calls itself the "King of Digimon". It lowers the opponent's fighting spirit to the end! Its acting ability is as good as a king!? The Etemon among Etemon, its love for being flattered surpasses all, and it has given itself the name "King of Kings". 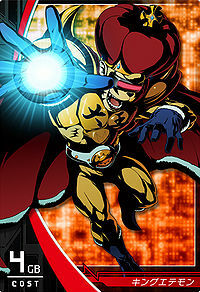 The Saru Suit it wears, which has the characters "Great King" written upon it, earns only scorn from other Digimon. ↑ Super Evolution Stage "Digimon Adventure tri. ~Adventure of August 1~"